Parquet Courts, Merchandise & Destruction Unit team up for a BV/Chaos bridge show! 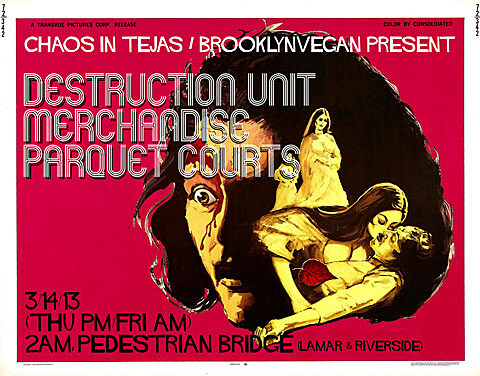 As discussed on BrooklynVegan, 2013 will be our second year of Pedestrian Bridge shows (Narrows played last year)… but this time on BV and Chaos in Tejas will welcome Destruction Unit, Merchandise and Parquet Courts! This FREE, all-ages show kicks off at 2AM tonight, March 14th (technically 3/15 in the AM) on the Pedestrian Bridge (Lamar & Riverside). The Bridge show is one of eight shows for BrooklynVegan and Invisible Oranges. (Can someone get us an espresso?) Chaos in Tejas is staying busy too.